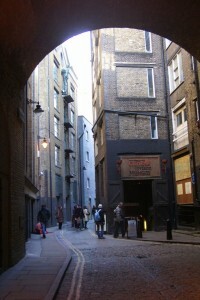 Back in Halloween 2009, we joined The Mirror newspaper for The Clink Ghost Hunt in London. It turned out to be a fascinating night of ghost hunting in one of London’s strangest locations. “I’ve just had a very strange ghost experience with an angry spirit called Thomas who hates women and will only answer to my voice. He has just made a glass move across the table and then flip on its side in fury almost shattering it. Then there’s the murderer who likes blondes and Alexander the physician who’s checking prisoners for the Plague. You might think I’m crazy and I’m still not sure myself, but these are just some of the ghostly residents of London’s haunted Clink Prison. When it comes to things that go bump in the night I’m a big sceptic so when The Mirror was invited to a ghost hunting evening with Fright Nights I jumped at the chance to explore the paranormal world. We all look at each other nervously and step forward into the pitch black not knowing what to expect. My heart is beating fast as Daniel calls upon any spirits to show themselves. ‘Roger’ enters the room and one of our group, Corina, volunteers to stand in Roger’s energy. She claims she is getting hotter and hotter while the rest of us are feeling colder. We move into the next room and this time it’s my turn to stand in the energies of a monk. I stand there for abut 5 minutes and at first I don’t feel anything. Others suggest the temperature has dropped. I still feel nothing….Suddenly, I start to notice a draft over my fingers – as though someone is lightly blowing on my hands. The room we are in has no windows or other doors. Corina says she feels “all tingly” then I start to get slight pins and needles in my fingers. It’s all very strange. I’m convinced that I’ve imagined the sensations in response to other people’s suggestions and my own anticipation but I’m not sure. In the next room we meet a murderer who seems to have taken a fancy to a blonde journalist in our group. He keeps saying ‘pretty golden hair’ over and over again. According to Daniel he’s a simple man who he compares to George from Of Mice and Men. Then the murderer turns his attentions to me. Daniel tells me that the man is picking up on the fact that I don’t like paying bills – don’t we all? He says that I shouldn’t leave them until the last minute. As we enter our next room Daniel says that he can see a ghost being flogged in the doorway while two men are stabbing a man to death. Daniel says he believes the pair are prison guards who are mistreating a prisoner. Sarah volunteers to stand in the doorway to see if she can sense anything. Daniel asks the ghost to give the group a sign that they are in the room by moving Sarah. We stare and wait in anticipation before Sarah suddenly falls backwards for a split second and looks visibly shocked. She said it was as though someone or something was pulling her. We then meet Alexander who Daniel explains is a physician examining prisoners for the Plague. Daniel says that while he’s communicating with Alexander he can feel pressure building up on his chest. Then someone from the group says that she feels the same. Her throat is burning and she feels pressure on her chest. The climax of the evening is séance which I take part in along with two other girls. A glass is placed upside down on a table and the letters of the alphabet are placed around the glass in a circle.